Yamaha has treated its FJR1300A and FJR1300ES sport-touring models to a mild makeover for the 2016 model year. The former Cycle World Ten Best-winning long-haul sport machine helped redefined the category when it made its stateside debut back in 2003. At the time Honda’s ST1300 was top dog in the class, but the FJR offered sportier engine performance and handling character at a significantly lower price. A sport-touring arms race soon escalated with the creation of the Kawasaki Concours 14 and BMW K1600GT, both leaving the FJR in their wake. While the FJR1300 saw minor updates in 2006 including a version featuring an automatic transmission, a major revamp in 2013 renewed the FJR’s status to that of an attractive, affordable alternative. Those Gen III updates compose its current feature set of YCC-T chip controlled throttle, D-mode, cruise control, traction control, ABS, heated grips, electronically adjustable windshield and adjustable seat and bar position. Yamaha further sweetened the FJR’s relative value with the electronic-suspension-equipped FJR1300ES a year later. Both versions of the 2016 FJR1300 retain the same liquid-cooled, 1298cc, in-line four-cylinder, fuel-injected, 16-valve engine with two key changes: a six-speed transmission and an Assist & Slipper clutch. Gear ratios have been altered with slightly taller first and second ratios, slightly shorter fourth and fifth gears and a top cog that’s significantly taller than that of its five-speed predecessor. The end result promises improved acceleration and more relaxed revs at freeway cruise. The slipper/assist clutch provides back torque reduction during deceleration for enhanced corner-entry stability and lighter effort required at the clutch lever. Both models have updated instrumentation featuring a redesigned analog tachometer (on the left) and center LCD display with what looks to be the same LCD arrangement on the right providing trip computer, electronic suspension and heated grip information. The same left-bar-mounted rocker controls all of the electronic assets. All-new “twin-eye” LED headlight and LED taillight/turn signals lends the FJR a fresh modern look. Exclusive to the FJR1300ES model are innovative LED cornering lights located along the brow of each headlight lens. The cornering lights are activated by an IMU that senses lean angle, thus sequentially illuminating an array of three LED lights on the side you’re leaned for extended headlight coverage into the corner. 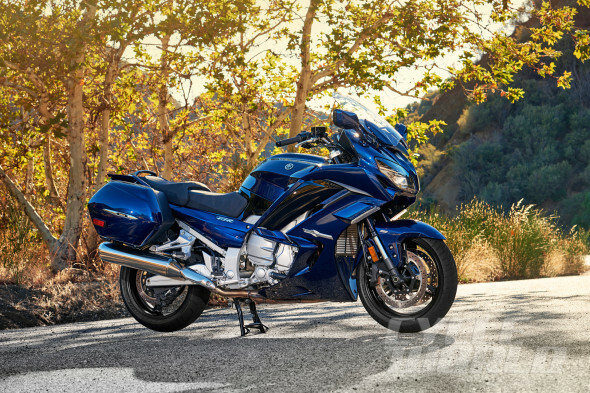 The 2016 FJR1300A and FJR1300ES will be available in Cobalt Blue, and are due to arrive in dealerships beginning in March. The MSRP for both models will be announced in February.